Yesterday, I ran my third half marathon and my first race in Minnesota! 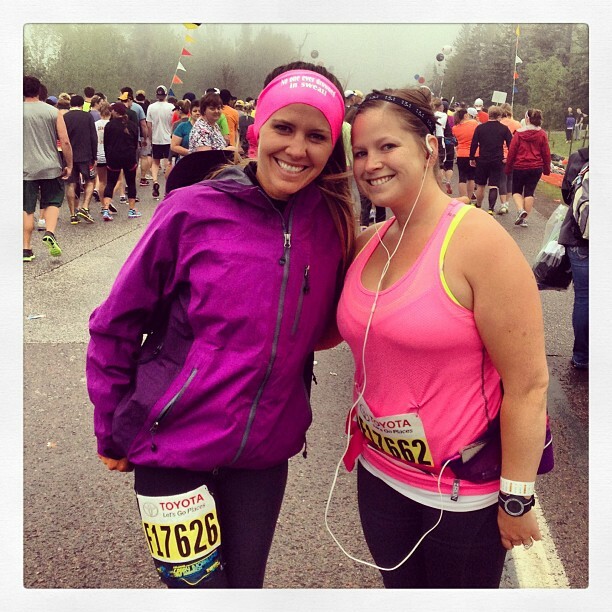 I had the opportunity to run in the Garry Bjorklund Half Marathon (part of Grandma's Marathon in Duluth, MN). This is by FAR the biggest race I have ever ran and it definitely took a toll on my nerves Saturday morning. I was so nervous. I constantly felt sick to my stomach. The thought of thousands of people running and watching was daunting. 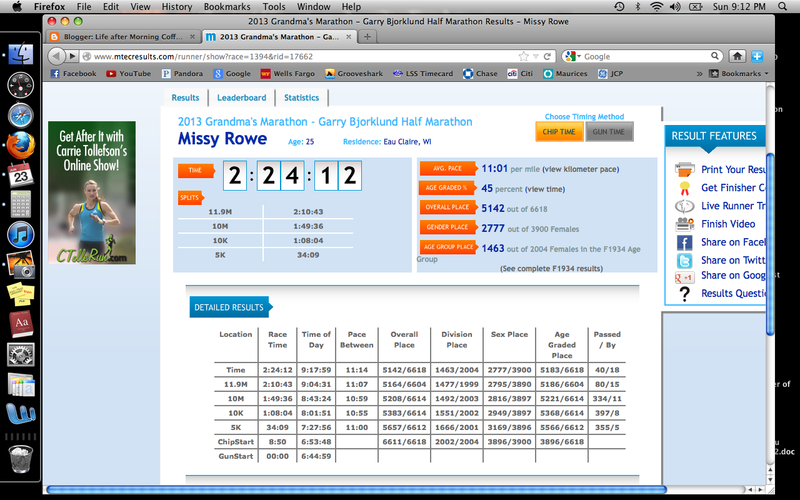 On my registration card, it stated that you must maintain a 13:04 minute mile in order to finish and that terrified me. I normally run 12 minute miles, so if I were to have a bad race, get hurt, or the weather held me back, I was very worried I wouldn't have finished after training and paying for registration, hotel, and gas. We had to wake up at 4:00AM in order to eat, drink coffee, get laced up, and catch the bus to the start line by 5:15AM. At 6:00AM, I arrived at the start line, used the bathroom, dropped off my gear bag, and met up with Lauren. Lauren is an AMAZING girl who has helped me so much with weight loss. She just launched her own business as a Nutritional Consultant Health Coach. Check her out at http://101laurenlane.com/ and get in contact with her, you won't regret it! Since I had just ran the Eau Claire Half Marathon on May 5th with a time of 2:37 and 12:01 minute miles (a PR for me), I was aiming for the same pace. However, at the expo the night prior to the race, they had pictures of all the pacers that were running the race. Next to the pictures, were wrist bands (shown in the above picture on my left arm) that stated what your time should be at each mile. For the heck of it, I picked up the 2:30 pace band and put it on the morning of the race. At 6:45AM, the gun went off and almost ten minutes later, I finally crossed the start line! For some reason, I didn't turn on my music until Mile 2. Between loud music playing at the start line, chatting with Lauren and her brother Bill, and the enthusiasm of other runners, I didn't feel the need for it. Within the first mile, Lauren and Bill were off to reach their own goal time and once the sound of my my own breathing and stomping got annoying, I turned on the tunes. That really put a pep in my step - I love my running jams! I honestly don't know what I really thought about throughout the race. I kept telling myself to relax my shoulders, shake out my arms, and concentrate on breathing. I recently read an article in Runners World magazine about inhaling for three strides and exhaling for two. I have been trying to work that into my runs when my breathing is getting uneven or out of control. It definitely helps calm my diaphragm and makes me more aware of my body. At every mile, I checked my pace band and watch. The 2:30 pace got further and further away... but not in the direction I thought it would be. At mile three, I was supposed to be at 34 minutes and was at 33. At mile ten, I was supposed to be at 1:54 but was at 1:49. Every mile, I got faster even though I knew I had enough time to slow down if I needed to and still meet 2:30, let alone match my time at the Eau Claire Half Marathon. By mile 12, I was 6 minutes ahead of schedule and finally passed the 2:30 pacer. I said "I've been looking for you!"... and passed him. HA! I ended up finishing in 2:24:12. Six minutes faster than my BIG goal, and 13 minutes faster than my (what I thought) realistic goal. I cannot believe that in seven short weeks, I improved by 13 minutes. I have to be honest, I did not keep up with my training in between races. I was extremely nervous, because I had not ran more than five times in between my races. I had not ran anything over five miles SINCE the Eau Claire Half Marathon. I felt completely unprepared. What an amazing PR. I cannot wait for my next race and to set my next goal. Hmm... what should the next goal be?? 2:00?! Full marathon?! Congratulations to all of my other buddies who ran the race and finished! Especially a huge congrats to Kathy who not only had a PR but a Boston qualifying time! She is one inspiring (and fast) woman. A huge thanks to Angel and Jacob, we probably wouldn't have survived a stay in Motel 6 without them! Jacob ran the full marathon and ran it like a champ. Angel, his wife, met him at the finish line! Also, congratulations to all of the other runners who were complete strangers, yet the most inspiring people I could have ever run with. I was able to watch people ranging from age 17 to 76, 100 to 300 pounds, missing or disabled limbs, and a woman battling cancer FINISH a marathon. The amount of courage and determination these athletes have is unmeasurable and I applaud them. Thanks to Grandma's Marathon and Duluth for putting on such a wonderful event.